This is a post about today’s popular Free Backup software for VMware and Microsoft. All free products are really free, lifetime, but have their limits, so in this post, we’ll give you an overview for three of them. In the past we have had a post about Top 5 backup software for VMware and the post has had quite a success, so today’s post is Top 3 Free Backup Software For VMware and Microsoft. If you’re really not willing to pay for backup software, read on. Your business might be a tiny business running like 10-15 VMs only, so why not going free only? Free products are cool as they are not time-limited, they are not trials which stops working after 30 days, but they still do their jobs to back up your virtual infrastructure. Some of them are more popular than others, and some are fewer knowns and popular than others. It is usually due to a time when this or that product has hit a particular market. While some of the products are here for a decade, others are just celebrating 3-4 years of existence. Also, some products did not target VMware (or Microsoft) at first, so it’s pretty common that there are differences in features implementation. Let’s start with the less known first for some, but maybe not for others. Altaro is one of the younger vendors out there, but they’re doing pretty well, especially in the Hyper-V market where they started early. But they also support VMware vSphere for several years so they catching up here. Download here. Download Altaro VM Backup – Protect your VMware and Hyper-V VMs for Free with Altaro VM Backup. 2 VM for Free, forever. Grab your copy now! You have a scheduler which allows you to schedule daily/hourly/weekly backups. You can, of course, backup running VMs and those backups are incremental. For new people: It means that only the first backup is Full. The second, third etc, are incremental. It takes much less time to proceed with incremental backup, compared to full. VMware change block tracking technology (CBT) is leveraged, allowing to scan the virtual disks only for changes since the last backup. The backups are compressed and deduplicated to use as smaller storage space as possible. Two virtual machines only which you can backup indefinitely. Restores from the last 4 weeks of backups. No retention policy – users need to manually remove the backups. This means that for the Free Edition, it’s a manual process and backups won’t be deleted automatically. Many of the advanced features such as replication to another location or even file-level restore are not present. For their paid offers, it’s worth to note that with Altaro you pay per host – Not per socket or CPU. This is pretty much different from other backup vendors where you pay per CPU socket. Download Altaro VM Backup and protect 2 VMs for FREE. Veeam has been around for a decade. They’re one of the vendors who are very present and very successful in VMware infrastructures. They also do a Hyper-V backup and physical Windows and Linux backup. Recently they have released U4 and at the same time, they changed their free version into a Community edition allowing you to backup up to 10 VMs within your infrastructure. Again, you have a schedule so you can backup running VMs automatically on regular basis. 10 VMs from your infrastructure, which is good. It is a free version allowing backing up to 10 VMs for free. 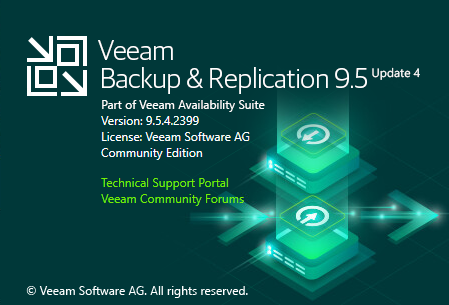 Veeam Backup Community Edition – Download Now. 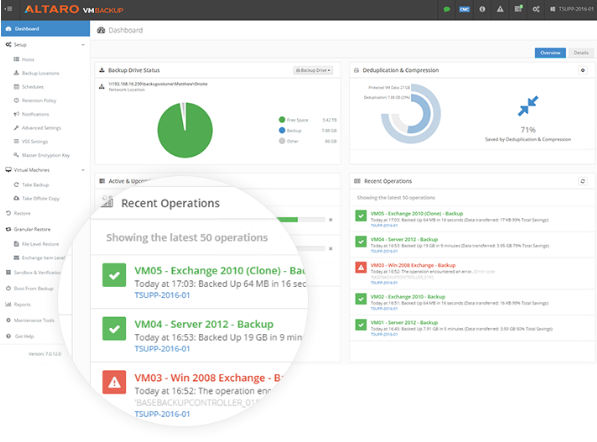 Users can start using Veeam without having to purchase any license. You’ll need Windows Server OS to install Veeam Backup. Nakivo has also free version which allows you to backup 2 VMs for Free. Nakivo can be installed on Windows, on Linux, on some popular NAS devices. It runs natively on QNAP, Synology, ASUSTOR, Western Digital, and NETGEAR. Download Nakivo Free edition here. As you can see, there are some great free backup software offers out there. 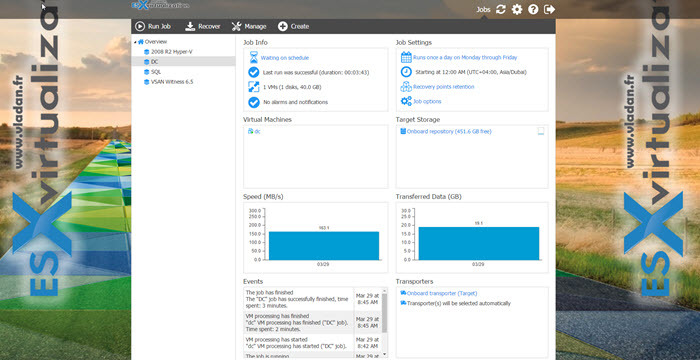 Whether you’re running a Hyper-V or VMware infrastructure, the tools are there. To install and configure each solution, it takes no more than 10-15 min. If you’re really on the budget and have only very small virtual iinfrastructure you might consider those offers and stay protected against VM corruption, ransomware or hardware failure. Remember always separate your backups from your virtual infrastructure. If anything goes wrong with your ESXi/vSphere or Hyper-V physical server, you can always replace the faulty hardware and restore your production VMs. If your backup server runs as a VM on your ESXi host and the motherboard dies, you can’t restore anything because your backup server died with the whole host. All three vendors support the latest VMware vSphere and Hyper-V.
As I mentioned, there are more vendors out there who do have a free version, but in this post, we only focused on three of them and we only scratched the surface with the features and functions that are (or are not) included. Perhaps in one of our follow up posts, we’ll have a look at other vendors from the virtualization eco-system. Make sure to subscribe to our RSS feed and social media channels for further updates. What are VMware Learning Credits?